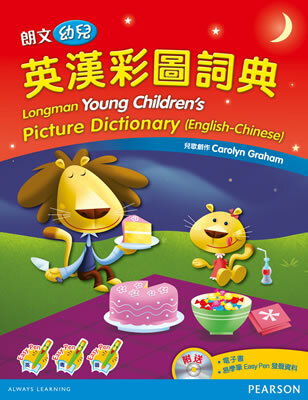 The Longman Young Children’s Picture Dictionary (English-Chinese) presents over 300 words in a variety of richly illustrated and photographed topics. The word list has been carefully researched to cover key words appropriate for students beginning to learn English. The accompanying free CD-ROM offers an e-book which enables children to listen to the vocabulary, dialogues, songs and chants. The dictionary is also “readable” by using the Pearson Easy Pen*. The Easy Pen audio data can be downloaded from the accompanying CD-ROM in just a few easy steps. *The Easy Pen is sold separately. Over 300 words arranged into 35 topics. The contexts and situations in the dictionary reflect children’s daily lives: family, playing in the park, in the classroom, food, clothes, etc. The 29 songs and chants created by Carolyn Graham help children learn English in a fun way. A simple dialogue is included in each topic, adding variety to English learning. Children can listen to the words, dialogues, songs and chants on the accompanying e-book (on CD-ROM). Words are pronounced in English, Cantonese and Putonghua, introducing children to trilingual learning. The dictionary can be used with the Pearson Easy Pen.